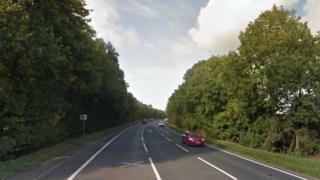 A man has died after his car was involved in a crash with a lorry. The victim was confirmed dead at the scene, police said. The lorry driver was unhurt. Diversions are in place and the road was expected to be closed for some time between the roundabouts for south Gobowen and Gledrid, Shropshire. West Mercia Police are appealing for witnesses to the crash which happened at 00:20 GMT on the A5 near the junction with Gobowen.